Scenehouse Paint will introduce students to traditional scenic art techniques using a range of materials. 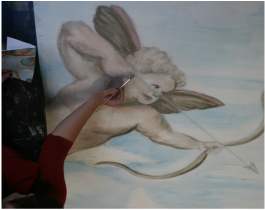 Expert tutors who are themselves professional scenics will provide instruction and demonstrations, whilst core Scenehouse staff will support students through a painting project. The techniques used in traditional Scene Painting are those used by Renaissance painters, and scenic artists for hundreds of years. Despite the popularity of contemporary digital processes Traditional Scene Painting is still at the core of most theatre production houses today. Images from last year's course can be seen here on the Gallery page. ​Participants will gain hands on experience with various materials and techniques culminating in a group project. ​Scenehouse Paint is sponsored by Rosco.